A haven of true tranquility amidst a native and natural resort setting. 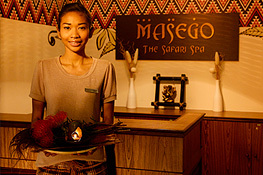 The First and Only Safari Theme Spa in Singapore. 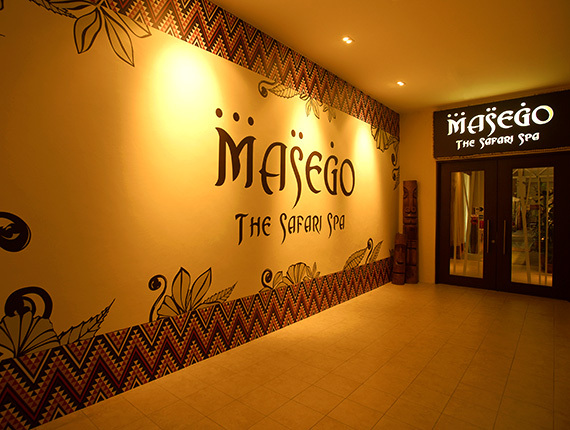 Experience the lushness of a Safari haven right here at Masego and be welcomed by the gentle humming of tropical birds as you relax and indulge your senses in signature spa therapies inspired by Mother Nature. With an encampment of 14 canopied tents, be transported into a haven of true tranquility amidst a native and natural resort setting. Mary Chia Holdings Limited is a leading lifestyle and wellness service provider in Singapore, and was listed on the Catalist of the Singapore Exchange Securities Trading Limited in 2009. With lifestyle and wellness centres in Singapore and Malaysia, Mary Chia offers a wide range of slimming, skincare and spa treatments. The company also owns and manages “Urban Homme” for men, “Go60″ for PMEBs and “Masego” for families. It also retails lifestyle and wellness products under the “MU” brand. The Mary Chia brand has always specialized in beauty and slimming services, this new move to develop a specialty spa that specializes in holistic, high-quality and innovative Oriental and Asian wellness therapy is an extension of the Company’s wish to further establish Singapore as the preferred spa and wellness hub in Asia, whilst further solidifying Mary Chia Holdings Limited as a leading spa and wellness service provider in Singapore.